people living even three miles away were considered neighbours. One of the neighbours was King Hem­ mingson. In spite of all our family being dispersed from Ontario to British Columbia, so far we have been able to maintain contact with all the family members - the descendants of John and Rose Soltys. Up to date there were 57 descendants and 52 still living. Marcus (Mark) - In 1929, Mark married Mary Kopeechuk in a ceremony at Mark's family home. Their first year of marriage was spent in Fairfax with Mark working for Bill Dabson. In 1930, Mark and Mary returned to the Scandinavia area. This was during the depression and no jobs were available. Mark was always able to provide food for the family but there was no money for extras. Mark and Mary moved to a farm three miles south of Erickson in 1937. When war broke out, Mark went east to work. The family purchased a farm just south of Erickson (where Bill and Edith Earley now live) in 1942. There they kept cows and sheep while Mark worked out to augment the family income. Mark and Mary retired to their home in Erickson in 1968. Mark passed away in September 1982. Mary passed away April 8, 1983. Both are buried at the Sacred Heart Church Cemetery. 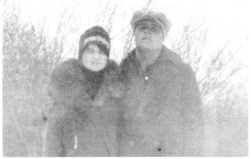 Rose (1929) married Harry Rempel and they live in Dauphin, Manitoba. They had seven children - Richard, Harry, Susan, Shannon, Tom, Lisa and Robert. Melvin (1934) married Heather Ironside. They live in Brandon, Manitoba and have two children, Mark and Donna. Joan (1939), residing in Winnipeg, married Carl Richert, and has three children - Ted, Jeffrey and Cindy. Carl was killed in a motor vehicle accident in 1982. Carol (1944) married George Pashnyk. They live in Brandon, Manitoba and have one daughter, Sandra. Thomas (Tom) - As a young man, Tom worked out as a farmhand to well known area farmers, Gust Lundman and Arvid Ullberg. In 1930, Tom married Anne Oleniuk at Ozerna. They moved to Erickson that same year with Tom doing odd jobs. He worked on the highway to Clear Lake and drove truck for John Wickdahl. Three daughters were born to Tom and Anne before Tom joined the Canadian Armed Forces in 1940. He served overseas in England and Italy, returning to Erickson in 1945. The family was increased with the birth of a son in 1948. Tom worked as a mechanic for Gordon Freko, Barney Berkowski and the Erickson Co-op. He retired in 1973. Tom was an avid fisherman and this hobby provided him with much pleasure in his retirement. Tom was a member of the Royal Canadian Legion as well as the Sacred Heart Ukrainian Catholic Church. Jean, born November 29, 1931, married Robert Shellborn and they now live in Burnaby, B.C. They have four children: Brian, who married Diane Canning, and they have three sons - Kurt, Brent and Mark. They live in Calgary, Alberta. 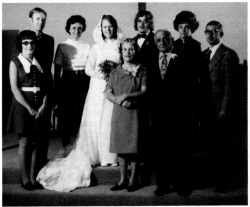 Ken, married Pam Grayston, and they have one daughter, Jennifer. They live in Aldergrove, B.C. Ron lives in Burnaby, B.C. Ruth, born October 16, 1938, and husband, Vern English, live in Brandon, Manitoba. They have two sons, Gary and Glen. Inez, born August 1, 1941, married Tom Gray, and they have two children, Debbie and Duane. They live in Portage la Prairie, Manitoba. Tom Soltys Family. Back Row. Left to Right: Tom Gray. Jean Shellborn, Valerie and Alan Soltys. Ruth English. Vern English. Front Row: Inez Gray. Anne and Tom.